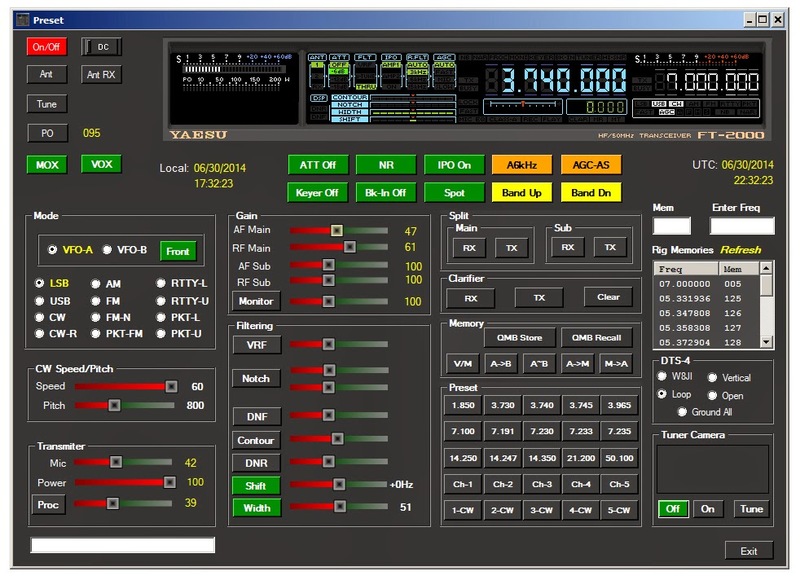 FT2K is one of many programs that can be used to control the Yaesu FT-2000D. It provides access to all of the essential radio control functions. In addition, FT2K can control an LDG DTS-4 antenna switch. FT2K connects to the DTS-4 via a serial interface giving the user the ability to select between 4 different antennas. My station uses a LDG AT-600Pro Autotuner for antenna matching. The AT-600Pro does not have a digital interface to monitor turning. To confirm a good tuning solution has been reach, I mount a camera in front of the DTS-4 and AT-600Pro. With the camera turned on, I can click on the Tune button to generate a 20 watt carrier causing the AT-600Pro to start tuning. By watching the led lights on the front of the tuner, I can see the tuner search and then lock on its best solution. When I see that a solution has been achieved I click on Tune to turn off the 20 watt carrier, then click on the the Off button to turn off the camera. It is important to be able to toggle the camera On/Off when operating remote because of the bandwidth required to send the real time video. FT2K also provides a Preset feature. 60m channels are all permanently programmed. The remaining buttons are set by Right-Clicking on the desired button. When you Right-Click on a button the current operating frequency, mode, and other radio settings are stored "under" the button of choice. Once programmed, the operator can move to any of the preset frequencies by simply clicking on the desired button.